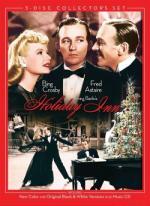 Experience one of the most popular holiday movies of all-time like never before with the 3-disc Holiday Inn Collector's Set featuring a brand-new color version of the film and the complete CD soundtrack! Screen legends Bing Crosby and Fred Astaire star as two talented pals who find themselves competing for the affections of the same lovely lady (Marjorie Reynolds) in this Academy Award®-winning† musical, filled with singing, dancing, comedy and romance. Whether you are watching the original black & white masterpiece, discovering the new color version, or listening to the timeless Irving Berlin soundtrack featuring "White Christmas," the 3-disc Holiday Inn Collector's Set is the perfect way to enjoy the holiday season! We've been trying to watch this for a few days, but life kept getting in the way. But finally we were able to! Here we have a couple of old Hollywood greats, Astaire and Crosby, doing what they do best (sing, dance, and romance). Crosby is in his usual fine form with several excellent songs, and Astaire wows us with his dancing, especially the firecracker number. Man, he sure could dance! I can't really consider it a Yuletide film however. Sure, part of the film is set at Christmas, but it encompasses many more holidays and doesn't really have the spirit I expect from a Christmas film. It is, after all, basically about one fellow trying to steal another's gal. Despite the political incorrectness of it today, I'm glad the blackface number is still included. We can't learn from the past by erasing it. If you must apply modern sensibilities to the number, consider that this was a different time and how far we have come from it - and how far we still have to go. However it's a great film, really lovely with a great nostalgic feel, warm and romantic. There's great chemistry among the cast, and you end the film with a smile on your face. Really, what more does one want from a romance and a musical? I will be untagging it from the Yuletide group however.